For other UW La Crosse organismal biology students websites check at http://bioweb.uwlax.edu/bio203/. 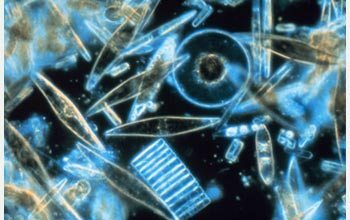 Diatoms are unicellular protists that consist of an estimated 200,000 species. They live mostly individually but in a few species they are form chains. Almost all are able to undergo photosynthesis, with only a few scarce exceptions. They are so prevalent and dominate in global ecosystems that they contribute an estimated 20 to 25 percent of the net global primary production. Diatoms are a relatively well studied species because of a key feature that they posses, which is their silica cell wall (frustules), which are considered beautiful. They were also once used to determine the quality of microscope lenses.